Piranesi's Ichnographia Campus Martius is a "text" of multiple historical accounts delivered through the combination of two languages. The Ichnographia tells the story of Rome when it was the capital of the ancient Western world. The story begins with Romulus leading the first triumphal march, and ends with the burial of the Emperor Honorius almost 1200 years later. Piranesi relates this urban history through a sequence of dual narratives--life and death, love and war, the profane and the sacred--which signify the continual theme of inversion and occasionally incorporate satire. Piranesi communicates this vast classical treatise through Latin labels which identify the individual buildings within the Ichnographia, and, most often, the written word requires a reading in tandem with the ichnography to grasp the full extent of Piranesi's copious message. 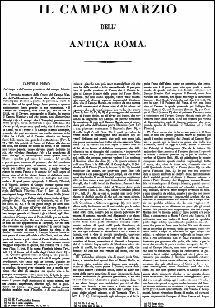 This unique aggregate language of word and image, moreover, readily affords a syntax where double meanings are not uncommon, and, hence, befits Piranesi's dual narratives of inversion and satire perfectly. The first page of Piranesi's history of the Campo Marzio. The Il Campo Marzio text is written in Italian, and presently no English translation exists. Within his archeological publication Il Campo Marzio dell'Antica Roma, Piranesi wrote a history of the Campus Martius. The text, which is written in six chapters and supplemented with extensive footnotes, is both factual and polemical, and, for the most part, relates directly to the various maps and perspectives within the same publication. (The Ichnographia comprises six of Il Campo Marzio dell'Antica Roma's forty-nine plates.) The history itself is based on numerous ancient texts, as well as some Renaissance texts. It is interesting to note, moreover, that 20th century archeology, even though many more physical remains within the Campo Marzio are now unearthed, still relies heavily on the same ancient texts. It thus becomes arguable whether Piranesi's text is due more archeological credit than it generally receives. - a place of assembly for the Roman people at the comitia centuriata; also, much resorted to by the Romans for games, exercise, and recreation, a place for military drills, etc. The scenerio of initiation - death to the profane condidtion, followed by rebirth to the sacred world, the world of the gods - also plays an important role in highly evolved religions. . . . From one religion to another, from one gnosis or one wisdom to another, the immemorial theme of the second birth is enriched with new values, which sometimes profoundly change the content of the experience. Nevertheless, a common element, an invariable, remains. It could be defined as follows: access to spiritual life always entails death to the profane condition, followed by a new birth. When Louis Kahn designs a museum, a similar emptying out occurs. These are sacred spaces for supra-earthly contemplation, where light is treated as a mystical presence or supernatural visitor, providing a model of what human users might aspire to. Thus the roof structure becomes and elemant of utmost moment and often remains unsettles and subject to change until late in the process. This could be read as an allegory--the roof is the building's link with heaven or the membrane between the building and the heavens. And the cloud that passes over gives the room a feeling of association with the person that is in it, knowing that there is life outside of the room, and it reflects the life-giving that a painting does because I think a work of art is a giver of life. So light, this great maker of presences, can never be . . . brought forth by the single moment in light which the electric bulb has. And natural light has all the moods of the time of the day, the seasons of the year, [which] year to year and day for day are different from the day preceding. One of the most wonderful buildings in the world which conveys its ideas is the Pantheon. The Pantheon is really a world within a world. The client, Hadrian, and the architect, whom I don't know the name of, saw the demand of this pantheonic requirement of no religion, no set ritual, only inspired ritual. He saw the round building, and a very large building. I imagine that he probably thought the building should be at least 300 feet in diameter; he changed his mind because there were no craftsmen who would make such a building, and it was out of the stream of economy. Economy meaning here that there's no man around to do it. I don't mean money--I don't mean budget--I mean economy. And so the Pantheon is now a hundred and some feet in diameter. The dome, the first real dome made, was conceived with a window to the sky. Not because of ethereal reasons, but because it's the least distracting, the one that is most transcending. And there is a demand from saying nothing specific, no direction; that's what form says to you, feeling and philosophy. It says no direction to this . . . no oblong . . . a square not satisfying here . . . too far and away at the corners. The round building is something which is irrefutable as an expression of a world within a world. The ambition and daring of the Pantheon design are utterly Roman, but in its planetary rotundity the building is also suffused with a quality of seeking for the comprehension of things beyond knowledge, a quality that records Roman sensitivity to human limits. The Pantheon exists because of a particular man, but the stirring and eloquent message preserved in the universality of its forms belongs to everyone. This is why it is the temple of the whole world. Ward-Perkins says, "With the building of the Pantheon . . . architectural thinking had been turned inside out; and henceforth the concept of interior space as a dominating factor in architectural design was to be an accepted part of the artistic establisment of the capital" Perhaps we should rather say: Architectural thinking had been turned "outside in!" The absolute rule of architecture is that the outside has to be different than the inside. This notion popped into my head sometime in the year 1983. Thus begins volume zero with an explanation of the absolute rule of architecture. At my first architecture job in Philadelphia, a co-worker was telling me about the nature of vapor barriers. It seemed clear that the primary job of vapor barriers is to keep the outside climatically different than the inside. It also seemed, however, to be a misdirected concern on the part of architects and engineers to make sure that buildings are so climatically controlled. But then again, it is impossible for any building to be the same on the inside as it is on the outside, climatically or otherwise. That is why I believe the ever present differentiation of inside and outside is the absolute rule of architecture. It is humanly impossible to design and/or build an architecture where the outside and inside are exactly the same. This absolute rule also implies that all architecture has to have an outside and an inside, therefore, that an outside cannot exist without an inside, and vice versa. [You may think there are some monuments that have an outside, but not an inside.] All great architectures take one of two attitudes when it came to the absolute rule: an architecture accepts the absolute totally or it attempts to disprove the absolute rule. Essentially, an architecture either exemplifies the absolute rule in all respects or an architecture exemplifies a working against the absolute rule. Fortunately, both approaches manifest perfectly valid architectures. In fact, the more extreme either approach becomes, the greater the architecture. [I have no idea of what this book is going to become, however, that, above all, is its beauty.] Perhaps what is most disturbing about the absolute rule is its absoluteness. There is nothing that anyone can do to change it. As long as humanity exists in a three dimensional environment, the inside will always have to be different than the outside. A good vehicle is something that allows transport, with a minimum of restraint, to somewhere very new, exciting, and perhaps even close to the ultimate truth. Many vehicles exist in the world: the parable, the fable, the novel, the 70 mm movie, to name but a few. Do the least expensive vehicles allow the freest thinking? A good vehicle takes you somewhere you do not yet know, and the best vehicle takes you somewhere that didn't exist until you got there. The metaphysics of going somewhere that does not exist evaporates with the journey's end and the reality there of. [I just said many incontiguous things. There are gaps within the argument process, as well as gaps within the connections of plausibility. The statements are naive and innocent like introductions usually are.] A diagram that surpasses the diagram of daVinci. Change the thinking on architecture. Explain the future of architecture. Knowing about architecture does not require building architecture, however. An idea made tangible. [What was] West Berlin is the world's first truly modern fortified city. There is the presence of graphics computers in architecture, and the new dexterity they manifest. Schinkel, Le Corbusier, Kahn, and Stirling, etc., etc. are there as well. Plus my own idealistic designs. Underlying all is the philosophical mode of self evidence. [My entire outlook on architecture, as well as on creativity, changed when I started to use a computer to draw.] The greatest ability a computer gives a designer is the designer capability to then be as whimsical as possible. Basically, the computer greatly accelerates the whimsical nature of the sketch. [I'm sure any architects believe the whimsical is precisely the least desirable of design solution.] With respect to the classical orders, Michelangelo is surely the most whimsical, followed closely by Edwin Lutyens. There are two kinds of search -- one where you seek to disclose a truth that lies at the base of a great deal of reality, and one where you seek to create a new reality. Both searches relate, however, in that each can only deal with that which already exists. [I'm jumping around from topic to topic, but I intend to bring them all together before the end of the introduction.] The absolute rule of architecture is nothing more than a pure statement of architecture's self-evidence. Mies van der Rohe is famous for his statement "less is more," the ultimate modern paradox, being not there surpasses being there. [I believe everything is the same thing, i.e., a wavelength.] Less walls means more windows, hence the outside can come inside. My arguments are circuitous, full of gaps, over-simplistic, but, then again, this is merely an introduction. I love to solve a problem creatively as long as the problem is one worth solving. Finding a problem worth solving is exactly like finding the best possible vehicle. --Stephen Lauf, Philadelphia, 1985.07.12 16:14 Friday. "(Schopenhauer, Borges remarks, has already written that life and dreams are leaves of the same book: reading them in order is living; skimming through them is dreaming.) In death we shall rediscover all the instants of our life and we shall freely combine them as in dreams. "God, our friends, and Shakespeare will collaborate with us." Nothing pleases Borges better than to play in this way with mind, dreams, space and time. The more complicated the game becomes, the happier he is. The dreamer can be dreamed in his turn." Between 3:30 and 4:30 I took a walk; turned out to be one of the nicest in a while. After almost two weeks of high heat and humidity, today was cooled down; I haven't been on a walk since Monday. Just as I was about to drive over to the parking lot at Lorimer Park, it started drizzling--hell, I'm going anyway; I'll take an umbrella. It's still drizzling as I start up the converted RR trail toward its end at Shady Lane; the tree canopy is my umbrella the whole way. Have I ever mentioned here the amulet shrine at the natural fountain within the 'canyon'? There's always some new little 'charm' embedded in the rock wall--that bone hanging from a string from a couple of months ago didn't last long though. Then turned into the woods toward the back of Fox Chase Farm. On a lot of these walks, I virtually have the whole place to myself, and today's rain kind of ensured that, but, as I made a turn in the path, at its end was something moving. I didn't have my glasses on, so I couldn't tell what it was, it looked too big to be a deer. Well, well, it's two young people, and one of them looks like their pulling their pants up. Did I just happen upon his and her teenagers about to make love in the rainy woods? I think so. Anyway, they weren't going to let me bother them; they just stepped about five feet into the woods and waited till I passed. Ah, finally, the fields again. First time seeing them in the rain. They haven't been mowed in a while. They have that full grown lumpy look. Went as far as the "bench tree of the cow pasture high point" (I'm pretty sure they're all blackberry bushes starting to show friut along the way) and then back into the woods. The sound of rain in the woods is quite loud, and found myself literally thinking out loud, "How did tammuz x put it, "The what of remedial what?"